ANN ARBOR–Energy-efficient lightbulbs are more expensive and less available in high-poverty urban areas than in more affluent locations, according to a new University of Michigan study conducted in Wayne County. U-M researchers explored disparities in the availability and price of energy-efficient bulbs by surveying 130 stores across Michigan's most populous county. They found that the cost to upgrade from a conventional incandescent bulb to a highly efficient light-emitting diode, or LED, was twice as high in the highest-poverty areas. At the same time, the price for less-efficient incandescent and halogen lamps (IHLs) decreased as the poverty level increased. According to the authors, those disparities could lead residents of poorer neighborhoods to continue buying IHLs and thereby miss one of the simplest ways to cut home energy bills: residential lighting upgrades. "The lightbulb price and availability patterns we found point to potential barriers to the adoption of energy-efficient lighting in higher-poverty neighborhoods," said study lead author Tony Reames, assistant professor at the U-M School for Environment and Sustainability and director of its Urban Energy Justice Lab. "The ability to benefit from the transition to more energy-efficient lighting is not equitably distributed, and those disparities raise energy justice concerns." The study is scheduled to appear May 15 in the print edition of the journal Applied Energy. In the U.S., lighting accounts for about 20 percent of the average household's energy bill, and residential lighting is undergoing a rapid transition to increased energy efficiency. But for many households–especially the poor–the upfront costs of upgrading from an incandescent or halogen bulb to more efficient compact fluorescent lamps or LEDs is a significant barrier, the researchers say. High-poverty neighborhoods often lack large retail chains that sell products at lower prices and are instead associated with small retailers that generally sell at higher prices, they say. And households in high-poverty areas often have less access to personal vehicles so are more dependent on the offerings of nearby stores. In their Wayne County study, the U-M researchers looked at residential lighting prices and availability at five store types: large retail stores such as Wal-Mart and Home Depot, hardware stores, variety stores such as Family Dollar and Dollar General, pharmacies, and small retail stores such as mini marts, corner delis and liquor stores. They surveyed stores in 18 Wayne County zip codes, stratified by the percentage of households living below the federal poverty level. They found that energy-efficient lighting availability and price varied across the county, with limited availability and higher prices disproportionately present in high-poverty areas. Large retail stores, primarily in areas with less poverty, had the least-expensive compact fluorescent lamps and LEDs. The most expensive CFLs and LEDs were found at pharmacies and small retail stores. In fact, none of the small retail stores in the poorest sector (40 percent or more of the households living below the federal poverty level) carried LEDs, while 92 percent of them carried less-efficient incandescent and halogen bulbs. 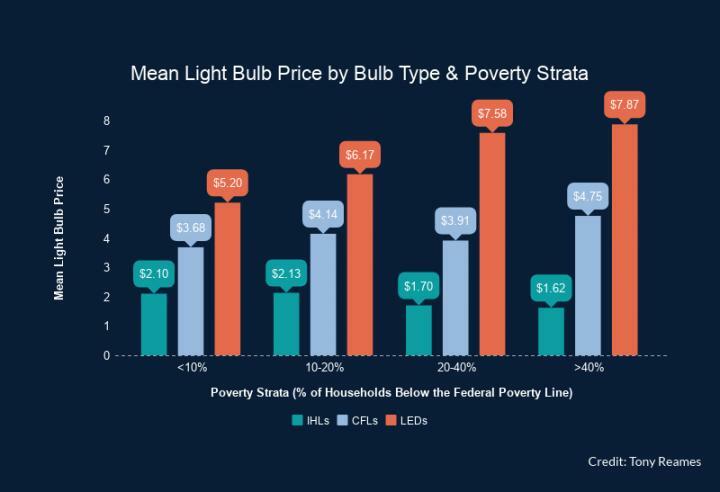 In the poorest areas, there was a $6.24 mean price difference between IHLs and LEDs, "a huge upfront cost in areas where 40 percent or more of the households live in poverty and roughly 27 percent do not have access to a personal vehicle," according to the authors. Wayne County has a population of 1.8 million. Overall, 22.4 percent of its households live below the federal poverty level. The county includes a major central city, Detroit, with surrounding affluent communities and suburbs such as the Grosse Pointe communities and the sizeable suburban cities of Dearborn, Livonia and Canton. Co-authors of the Applied Energy paper are Michael Reiner, a graduate student at U-M's School for Environment and Sustainability and at the College of Engineering, and M. Ben Stacey, a graduate student at the School for Environment and Sustainability and at the Taubman College of Architecture and Urban Planning. The study was first published online March 7. Study: Are birth mothers satisfied with decisions to place children for adoption?